The UK Foreign and Commonwealth Office has hosted representatives from government, industry, business and organisations from around the world to consider how to go about reaching an international agreement regarding behaviour in cyberspace, but why is this necessary? Has the internet not taken care of itself so far? Surely freedom from controls and regulation is what has enabled the internet to flourish? And flourish it has. Much of the opening day of the two-day London Conference on Cyberspace was devoted to the benefits the internet is bringing to a wide range of societies. Foreign Secretary William Hague said he relished how social media has narrowed the gap between government and individual citizens. "It allows the exchange of ideas between people who otherwise never would meet," he said. Speakers from diverse regions of the world gave examples of how people are adapting technology to their local circumstances. This includes mobile banking across Africa, and social media giving people a voice in Libya and Egypt. "The internet has profoundly changed our economies. Studies show it can create twice as many jobs as it ever destroys, and it's estimated that for every 10% increase in broadband penetration, global GDP will increase by an average of 1.3%," UK Prime Minister David Cameron told the conference. Cyberspace plays a catalytic role in advancing human development by improving access to information and service delivery, and enabling broader democratic participation, said Helen Clark, administrator of the United Nations Development Programme. Examples include linking remote health clinics with specialist diagnostic centres, linking students in rural areas with teachers and knowledge, and enabling people to interface with public institutions and services, she told the conference. A more open world economy and more open societies have lifted billions of people out of poverty and created new hopes for further billions, said Carl Bildt, Swedish minister for foreign affairs. "A new wave demanding dignity and democracy is sweeping our world, and the internet is a key part of this story," he said. While all this supports an extremely positive outlook for the future, speakers at the London Conference on Cyberspace all admitted to having fears that the internet may be prevented from reaching its full potential in a variety of ways. The chief concerns are around limited or restricted access to the internet and the rise in the malicious use of digital networks by criminal and state actors. The glaring inequalities are illustrated by the fact that 95% of people in Iceland have access to the internet, compared with only 0.1% in Liberia, said Hague. "It is my passionate conviction that all human rights should carry full force online - not just the right to privacy, but the right to freedom of expression." Hague said the UK rejected the view that government suppression of the internet, phone networks and social media is acceptable at times of unrest. "The exploitation of digital networks by a minority of criminals or terrorists cannot be a justification for states to censor their citizens," he said. Technology lends itself to misuse, as well as to great benefit, which is particularly true of crime, which is growing exponentially online, said Hague. "Across the globe there are people and groups seeking to turn our personal information into cash or to wreak havoc on the net to express political grievances." Cameron said cybercrime costs the UK an estimated £27bn a year, and globally it is as much as $1trn. "Every day we are seeing attempts of an industrial scale to steal valuable information from individuals and companies," he said. It will become harder to protect users and prevent defences from being swamped as the scope for malignant activity widens alongside advantages, said Hague. Putting this in perspective, he said more than six million unique types of new malware were detected by industry in the first three months of 2011 alone. "It is increasingly clear that countries with weak cyber defences and capabilities will find themselves exposed over the long term, and at a serious strategic disadvantage given the apparent rise in state-sponsored attacks," he said. Speakers at the London Conference on Cyberspace expressed in many different ways the same view that to support a future in which the benefits of the digital age are expanded to all peoples and economies of the world, and the risks minimised as much as possible, decisive action is required without delay. Five billion people are expected to connect to the internet in the next 20 years, and the benefits they enjoy will depend on the choices made now, said US vice-president Joe Biden, who addressed the conference by video link. He said there is no need to start from scratch, however, as there are well-established principles of international law that apply equally online. "Cyberspace is a new realm, but we have years of hard-won understandings to guide us," said Biden. While agreeing that action needs to be taken now, speakers at the conference were unanimous in expressing the view that heavy-handed state control is not the way forward, and that an alternative must be found. "Nothing would be more fatal or self-defeating than the heavy hand of state control on the internet, which only thrives because of the talent of individuals and of the industry within an open market for ideas and innovation," said Hague. The greatest threat to cyberspace is not cybercriminals, but misguided and over-reaching government policy, said Wikipedia founder Jimmy Wales. Government controls are not the solution; there are better ways of dealing with problems on the internet than relying on top-down legislation from governments, he said, such as the community mechanisms used by Wikipedia and other internet-based organisations. The common goal that emerged at the London Conference is a cyberspace that is not stifled by government control or censorship, but where innovation and competition flourish, and investment and enterprise are rewarded. "We must strive for a model for internet governance in which governments, industry and users of the internet work together in a collective endeavour, establishing a balance of responsibility," said Hague. Cameron said the UK will shortly set out a new approach for better online security, crime prevention and public awareness. "But a cross-border problem needs cross-border solutions, which is why they world needs to act together," he said. 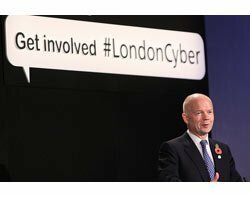 There is currently no forum in which nations, business and civil society can engage as equal partners to discuss issues in cyberspace, and that needs to change, said Hague. "In place of today's cyber free-for-all, we need rules of the road," he said. To that end, the UK has proposed a set of seven principles as a basis for more effective co-operation between states, businesses and organisations, to act as a starting point in efforts to reach a broad agreement about behaviour in cyberspace. The goal is striking a balance between freedom and a free-for all, said Cameron, but getting there needs everyone to play their part. Follow-on conferences on norms of behaviour in cyberspace are to be held by Hungary in 2012 and the Republic of Korea in 2013 to build on discussions at the London conference. Across all speakers at the conference, there was agreement that the world needs to take action now to ensure that individuals, business and governments are able to have safe and reliable access to cyberspace without fear of attack or restriction of rights; and that international collaboration and public-private partnerships are crucial to achieving this goal. Cyberspace needs to be a competitive environment which ensures a fair return on investment in networks, services and content.